Bubba Brayna’s legendary latkes lure an unexpected visitor into her home in this playful Hanukkah tale from a master storyteller. Bubba Brayna makes the best latkes in the village, and on the first night of Hanukkah, the scent of her cooking wakes a hungry, adorable bear from his hibernation. He lumbers into town to investigate, and Bubba Brayna—who does not see or hear very well—mistakes him for her rabbi. She welcomes the bear inside to play the dreidel game, light the menorah, and enjoy a scrumptious meal. However, after her well-fed guest leaves, there's a knock at the door—it's the rabbi, and all of Brayna's other friends, arriving for dinner. But there are no latkes left—and together, they finally figure out who really ate them. 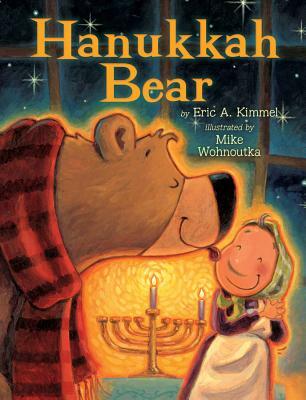 Lively illustrations by Mike Wohnoutka, portraying the sprightly Bubba Brayna and her very hungry guest, accompany this instant family favorite, a humorous reworking of Eric A. Kimmel’s earlier classic tale, The Chanukkah Guest. A traditional recipe for latkes is included in the back matter, along with interesting, digestible facts about the history and traditions of Hanukkah. A 2013 National Jewish Book Award Winner, this book is perfect for a holiday story time with children— either in the classroom or at home, as an introduction for young readers to the traditions and customs of Hanukkah, and as a classic to return to year after year. Eric A. Kimmel is known for his folktales and legends from all around the world. He lives in Oregon. Mike Wohnoutka illustrated Jack's House, by Karen Magnusen Beil, as well as other books. He lives in Minnesota.